When it comes to household hygiene, proper and regular cleaning is essential for your health and well-being. Creating a healthy home environment is one of the reasons why you should hire a cleaning service. However, even if you rely on the best experts for house cleaning in Cypress, TX who can clean your home perfectly, there are still a few important things to keep in mind. You need to strive to find reliable and insured house cleaners and hire the best service available. 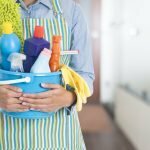 Why should you clean your house? inspiring home environment. However, people rarely know all the benefits that a clean home offers. In fact, there are more than a few health-related and general reasons why you should clean your house regularly. Believe it or not, a messy, cluttered home can increase your stress levels and make you feel more tired. Living in a messy environment will keep reminding you of all the things you need to do on a subconscious level. In addition, if your home is cluttered, you won’t be able to find a pleasing spot where you can direct your gaze and rest your eyes. Also, sometimes you cannot find something you’re looking for in a messy home, which can irritate and stress you out. The mess and clutter in your home will keep collecting dust, mold and other allergens, increasing your and your family’s risk of experiencing allergic reactions. You’d be surprised how many allergens are hiding in an average household. Learning more about some of the allergens may also help you deal with them more effectively. You can always inform yourself more on the topic by researching the American Academy of Allergy Asthma and Immunology. This is one of the greatest advantages of a clean home, especially if you or your family members often experience severe allergic reactions. Of course, if you hire a cleaning service, they’ll clean your safe haven to the last speck of dust. Cleaning your home regularly can also help you sleep better, too. Cleaning tasks can be a bit tiring, which can help you fall asleep easily. You also won’t be bothered by a messy house and a lengthy cleaning to-do list, so you’ll be able to relax in the evening. Also, sleeping in a clean, allergen-free sleeping environment will reduce your risk of experiencing allergic reactions during the night. Not only is your home fraught with hidden dangers, but a great number of them are hiding in unexpected places. Aside from common household allergens, you can also find a great level of volatile organic compounds (VOCs) and other toxins hidden around your house, especially within rug and carpet fibers. These and other toxic chemicals can be released into the air through the process of off-gassing and reduce your indoor air quality. Consequently, this can cause a range of health problems both in you and your children, including allergic reactions, eye and skin irritation, breathing difficulties, etc. What’s more, a healthy, clean and clutter-free environment will also boost your mood because you’ll be able to spend time in an open, fresh and airy atmosphere. 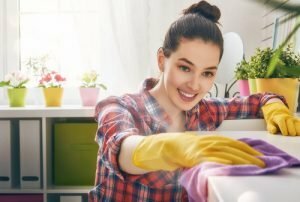 How clean should your house be? You might be wondering what’s clean enough when it comes to your home. Although different people have different expectations when it comes to household hygiene and cleanliness, there are some basic requirements that you need to meet. You should throw away all the expired and spoiled food to prevent your family members from getting food poisoning and germs from spreading. You also need to clean your food preparation areas daily and wash the sponges regularly. Also, cleaning the bathroom should be done regularly for maintaining adequate hygiene levels. Vacuuming and dusting are cleaning tasks that should also be done on a regular basis. 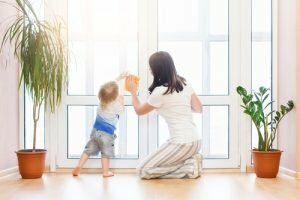 To clean your home properly and maintain a healthy atmosphere, you should learn how often you should clean your house and which tasks should be done more frequently than others. 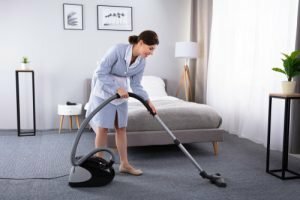 What are the benefits of hiring a home cleaning service? If you doubt that hiring a cleaning company is for you, you should consider the main perks that such a service offers. Clean home. If you hire cleaning professionals to tackle your housework, you’ll have a clean home at all times. You won’t have to worry about the endless list of chores or your guests coming over and having to do some last-minute cleaning. Instead, a reliable crew can come at the agreed time and give your home a cleaning treatment it deserves. More free time. How many times have you wanted to go to the Mayer Park with your children, but you couldn’t because you needed to do all those boring household chores? You won’t have to sacrifice your precious family moments if you hire a cleaning team because they’ll deal with the mess while you take some time for yourself. Use of proper products and techniques. You’d be surprised how many cleaning mistakes we make on a daily basis. Cleaning professionals, on the other hand, know the proper ways to clean a home and they use appropriate cleaning supplies. You won’t have to worry about damaging your cleaning surfaces because you can rely on the experts to clean and treat them with the utmost care. Exceptional results. When cleaning our homes, we often want to just get it over with, so we don’t mind missing a spot or two. This isn’t the case with professional cleaners because they’re detail-oriented and meticulous. Once they’re done, there will be no speck of dust in sight. Whether you have no time to deal with cleaning chores or you simply don’t enjoy cleaning, you can just contact That’s Clean Maids and we’ll take care of it. We will send the most experienced and qualified cleaning crew to take over your cleaning chores and provide you with house cleaning service Cypress TX is proud of. From dusting and mopping to carpet and tile grout cleaning, the cleaning experts we work with are the best ones in the business. You can rest assured that your home will be spotless after each and every one of your cleaning session. Book with us and see for yourself!